Janome Hello Kitty Sewing Machine Reviews | Super Cute! Hello Kitty Sewing Machine Reviews – Reliable AND Cute! My niece is in love with Hello Kitty and also loves to sew. She has been asking her mother for a Hello Kitty sewing machine for her birthday. Her mother (my little sister) was completely against the idea of buying one because she assumed that because it was a machine with a cartoon character on it, it would be of cheap quality. She asked me for my opinion and I was happy to help. Are The Hello Kitty Sewing Machines Any Good? During my initial research I was pleasantly surprised that they were made by Janome. Janome is known for their excellent quality sewing machines, but would these ones be different? I took a test drive of all four Hello Kitty sewing machines to find out. Continue below to find out how each sewing machine measured up. However, you should note that the Janome 11706 is considered an entry-level machine and doesn’t have as many features as you will find in some more expensive models. If you or your child is more experienced, you might want to consider the other two models I review below. One very nice thing about this mini sewing machine is its size. It is a 3/4 sized machine which means that it is 25% smaller than a regular sewing machine. Being relatively small means that it is easy to take with you. You can move it from room to room or travel with it to a sewing class very easily. Due to its size, you may get the impression that it is cheap and junky like most sewing machines that are made for kids. Thankfully this is not the case with this machine. If you are buying this for a beginner, the Hello Kitty Janome 11706 would be an excellent choice. It is small, easy to handle, but still produces excellent results that won’t frustrate a newbie. The stitch quality is excellent and it runs perfectly. I definitely wouldn’t hesitate getting this machine if I was buying it for a Hello Kitty fan and they were new to sewing. It is an outstanding beginner machine. The Janome 13512 would be the next step up in features from model 11706. It comes with 15 stitches (instead of 11) and a 4 step buttonhole. It is also a regular sized machine and comes in a very nice solid red with Hello Kitty’s cute face peaking out from the bottom right-hand corner. After trying this out I can say that this is another outstanding Janome sewing machine. It may look like a toy, but this machine is definitely not a toy. It is very sturdy, well-made and is perfect for a beginner or even good for someone who has a lot of sewing experience. If you love Hello Kitty and want a sewing machine with a nice set of features, but don’t want to spend too much then you will be happy with this machine. The manual is also excellent. If you have a little bit of experience you’ll find that getting yourself up and sewing won’t take much time at all. If you’re a newbie, the manual does a good job teaching you the basics of the machine. Once I had it running I noticed that the quality of stitch is excellent and I was very happy with how smooth the machine ran. The results of every project that I tried were excellent. I LOVE this machine. I love the way it looks and love the way it sews. My younger self would have been absolutely thrilled with a machine that looked this cute and performed as well as the Janome 15822 sewing machine. White with red trim, this machine is a girl’s dream and comes equipped with 22 stitches and a one step button hole. If you are looking for a grown-up Hello Kitty machine or want something that your daughter can grow into then this sewing machine is the one. This machine is great for beginners, but isn’t just for kids. It performs outstanding and exceeded my high expectations. It runs really smoothly and quiet and produces perfect stitches every time. After getting a chance to play around with this machine I ended up purchasing it for one of my nieces. She was absolutely thrilled and has completed dozens of projects on it with excellent results. Every time I see this machine in her room, part of me wishes I had bought this for myself :). 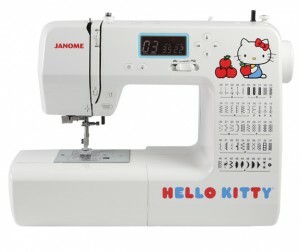 The 18750 is the computerized model in Janome’s line of Hello Kitty sewing machines. With this machine you receive 50 stitches, 3 one-step button holes, automatic needle threader, drop-in bobbin, free-arm, start/stop button, up/down button and a speed controller. The fact that this machine auto-threads, has a drop-in bobbin and buttons that control the starting and stopping of the machine made this one a breeze to use. If you are planning on using this machine for mostly lightweight fabrics then it will do the trick. One thing of note is if you are going to be working with heavy duty fabrics, then you probably want to look at a more powerful machine. However, for most people this machine would do perfectly. This full-sized Hello Kitty sewing machine runs quietly and does a nice job with the vast array of stitching options available. If you are looking for a machine that is very simple to use and don’t mind spending a bit more, then this machine is for you. Which Hello Kitty Sewing Machine Should I Choose? If you are looking for a beginner sewing machine for the Hello Kitty lover in your life you can’t go wrong with any of the machines above. If you are shopping for a child I would look at the green Janome 3/4 sized sewing machine . Children find it easier to work on the 3/4 sized machine and its easy to transport and has simple features that aren’t overwhelming. I can’t stress enough to avoid buying those cheap little kids sewing machines that you see out there. Yes, they are less expensive, but that comes at a cost. They are poorly made and you will likely end up having to buy a more expensive one after it breaks down. You won’t have any problems like that with a Hello Kitty sewing machine made by Janome. They are easy enough for a beginner to use, but built to last. These units are perfect if you want to teach your children the basics of sewing, and if you want to find out more just click the link. And for get more info about projects that your kid can start on, just click here. I hate to admit that I would spend those extra 100$ to buy my daughter a HelloKitty machine instead of a basic beginner one… and I feel so bad about it! When it comes to my daughter, I become much more consumerist than when I have to buy something for anyone else! Have you used the Janome 18750 Hello Kitty computerized sewing machine? I actually haven’t had a chance to try the computerized Hello Kitty machine yet, but last week I arranged to borrow one and will be adding it to this page shortly. Hopefully I will find time to look at it in the next week or so. Thanks for visiting and for your question. I ended up buying the machine you got for your niece. Overstock had a 48 hour sale. It was $165. I was trying to decide between that one and the computerized machine, which was also on sale but still a bit pricier. Your great review helped sway me. I’m new to sewing. Bought a vintage Necchi Sylvia but am having a hard time with tension issues. It gets me quite frustrated. I just want to get right to sewing. I’ll be keeping an eye out for your review. Take care. I have a nine year old daughter, who is indifferent to Hello Kitty. Neither she not I have any sewing experience, but she is very interested in learning. I’m debating over the Brother XL2600i or the above Janome Hello Kitty brands. Which do you think would be for her? It really depends on how much you want to spend. Most nine year olds would be successful on any of those machines. My personal preference is Janome over Brother, but they are a bit more expensive. That’s not to say the Brother machines are bad, but they are a small step below the Janome in quality. I know that doesn’t answer your question, but gives you something to consider. Good luck! Thank you for your reviews. You’ve given many options to choose from. My daughter is 8 and is interested in learning how to sew. My question is a bit silly, but when I went on Amazon’s website to look at the options I didn’t see any cases that come with the machine. Do you have to purchase the case separately? If so, would you recommend a hard or soft case? Thank you so much for your reviews. I have a 7 and 9 year old asking for a sewing machine. Which one of these would you recommend for children with their ages? They are newbies. Thank you! No problem, I’m glad to help. Really, you can make an argument for any of the three Hello Kitty machines. For that age, the 3/4 size 11706 is a good choice. However, if you think there is a good chance they will still be Hello Kitty fans then you may want to buy one of the more expensive ones that they could grow into. Each are easy enough for them to use with a little bit of guidance so there is no worries there. I hope that helps. Does the janome 11706 use power or is it battery run? Hi Beverly, the 11706 uses power and does not require batteries. Hi. Does the Janome 15822 have a finger guard. Thank you. The Janome Sew Mini 125 has slow speed and presser foot that reduces the risk to tiny fingers. I purchased one because I have a very petite 5 yr. future sewer who really wants to sew and I wanted a machine that wouldn’t go faster than she can control and does provide some protection while she and my grandson age 7 are learning. Of course adult supervision is the best safety precaution. No problem at all. I think most would find it easy to use. It comes with 22 stitches and has a heavy duty frame so is good enough for anyone of any skill level. You shouldn’t outgrow it unless you want to get into really heavy fabrics, quilting or embroidery. For 90% of users, it is a perfectly good machine. Thank you so much for your thorough reviews of these machines. Two of my daughters have expressed interest in having their “own” sewing machines. I have two, but there’s just something about having their own. 🙂 So, I was looking into buying one of these, but was unsure of the quality. I feel much better after reading your reviews. We went down the path of buying a cheap kids’ Singer. It was a complete frustration for my daughter and for myself. It was impossible to thread and only did one basic stitch. I completely agree that a real machine is the only way to go! I enjoyed reading these reviews. My friend’s daughters each have a Hello Kitty sewing machine and I’m wondering if / where I can purchase replacement cotton spools and bobbins. Hi Janie, thanks for your lovely comments. I am not really sure where you can find those. You might want to give Janome a call or email directly to see if they could send you some or point you in the right direction. Many thanks – I’ll be in touch regarding the outcome. I use to be a truck driver….cross country. I drove with a co-driver and when he went on “home time” I stayed in a motel….as seriously…hand sewed dresses, etc. I loved to sew but my sewing machine was too big to pack around in a truck. I ended up taking one my Mother let me use, that was small but still bulky. Wow…I wish I would have had one of these little Kitty sewing machines! It would have made my motel stays a lot more productive. A great idea for the seamstress truck driver! There are a lot of us out there! I started in 1978 when there were very few women drivers. Got off the road for 21 years and now there are a LOT of us. A lot of us like to sew in our pass time too! Fixing work clothes saves a lot of money when you know how to mend. A little sewing machine like this would be such a help! Thanks for your site. It helped me a lot to decide which machine I want for home. Thanks so much for your review! I absolutely love Hello Kitty and found this page after reading your reviews for beginner sewing machines. 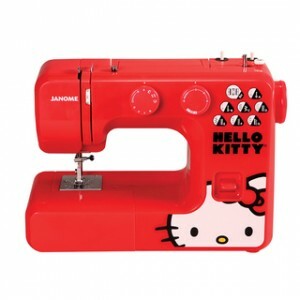 I am going to purchase the Janome 15822 Hello Kitty Sewing Machine and can’t want to get it! I’m very happy for you and really hope you enjoy your new sewing machine! Thank you for your article. My soon-to-be seven year old daughter is showing interest in sewing as I’ve taught myself the basics the last few years. She is indifferent to Hello Kitty but I want her to start on the ‘right foot’ with as little frustration as possible to keep her interest up. Which can be hit or miss, I know. 😉 I taught myself on a Brother cs6000i (with lots of youtube video help) and was very fortunate to be gifted a used Bernina Artista 180 that just needed a few missing parts. I’m now pretty comfortable with both machines. So, to keep my own frustration level low too, I’d like to make the Brother ‘her own machine’. But, do you think this machine choice would be an unwise move for a child her age? I don’t see an issue with your child learning to sew on the Brother CS6000i. As long as you are there to show her to basics and help her grow her skills, that should be perfectly fine. I would like your opinion between two machines I’m considering for my 11 year old daughter that is interested in learning how to use a sewing machine. 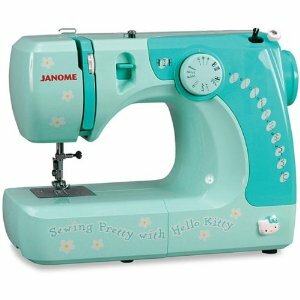 I’m torn between the reviews for the Janome sew mini 2-stitch and the Janome Hello Kitty 11706. She is not really a hello kitty fan but does not mind using it if it is her best option. I would really appreciate your opinion on which sewing machine would be best for her. Please feel free to recommend one that I did not mention as I am open to suggestions! Thanks for visiting. Since she is 11 and likely to outgrow the mini 2 stitch quickly I would probably go with something else. If she isn’t interested in Hello Kitty either then I would recommend a nice, reliable beginner sewing machine like the Janome 2212. It is inexpensive, reliable and easy to use. I hope that helps. This is very silly. I am a 40 y/o and I really want a sewing machine. I would be considered a beginner bc I haven’t sewn since I was a child. Is there really much of a difference in the performance bt a smaller machine made for a girl? I am a very small person so …. I don’t know if that matters. I love the idea of having hello kitty on my machine and the prices don’t really seem to be much different w the branding on it. so, basically, as an adult woman, is this size OK for me to use? I was looking at the computerized machine. Absolutely. 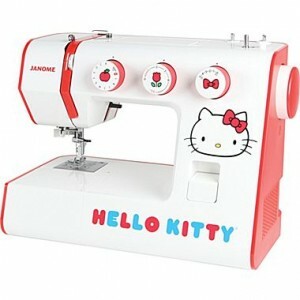 The computerized version of the Janome Hello Kitty sewing machines is actually the same size as a regular sized machine. It is perfectly suited for a beginner and I think you will really like it. hi I’m a beginner sewer and looking to make different projects….can the red sewing machine sew through leather or pu leather? Hi Carmen, the Red Janome Hello Kitty sewing machine is a very good beginner machine, but it is very unlikely that it could go through leather. If you want to work with leather then you’ll need a heavy duty sewing machine like the Janome HD3000. Thank you so so much for the review, I wished I had stumbled upon this before purchasing. My soon to be 8 year old is begging for her own sewing machine, as well lessons, I went ahead and purchased the Jenome 13512 for her, but now I’m thinking I would like one that she can grow into. Would you recommend 15822 or the computerize 18750 for her?, one of the project she would really like to make is a Rag quilt, would any of those machine be abe to handle that project? I haven’t used the 13512 to make a quilt before, but don’t see why it couldn’t do it. This model should be capable of doing most everything that your daughter would need. I don’t think there is any reason to exchange it, but that’s just my opinion. I’ve been in love with the 15822 for a long time from reading yours & other reviews. I finally got one last week & was so excited to use it. The bottom thread was looping at first but I kept re-threading it & at last it made a good stitch. But I find the stitch selector knob is very hard for me to turn due to my arthritis. The other knobs are OK but I’m about to return it because of this. Are all the 15822’s hard to change the stitch selector or is it just me? Are there other mechanical sewing machines that aren’t so hard to turn the stitch selector knobs & are around the same price as Hello Kitty or less? Also, I wish I could find a mechanical machine that has the blanket stitch for applique–I get tired of the same old zigzag for that & don’t need the fancy curly stitches for applique that usually come on lesser expensive machines. I may be asking too much. Do you have any suggestions? Thank you. I can’t seem to find a whole lot of solid information/reviews for the pink 14412 model. Have you heard anything about this particular model? Seems like it may have been sold at Target, but not positive. I haven’t seen too much on that one either and have only seen it on the shelf so I can’t really comment on it. If I get a chance to try it out I will add it to this page.